What Gmail Triggers and Actions are Supported? New Email Matching Search - Triggers when you receive a new email that matches a search string you provide. New Labeled Email - Triggers when you receive a new email and label it within two days. New Attachment - Triggers when you receive a new attachment (triggers once per attachment). New Starred Email - Triggers when you receive a new email and star it within two days. New Thread - Triggers when a new thread starts. New Email - Triggers when a new e-mail appears in the specified mailbox. New Label - Triggers when you add a new label. Create Label - Creates a new label. Remove Label from Email - Remove a label from an email message. Add Label to Email - Add a label to an email message. Find Email - Finds an email message. 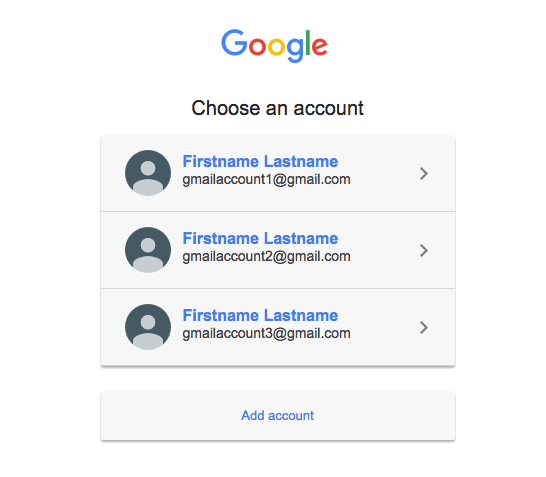 Admin/owner permissions - In order to send emails from another email address, you need to have proper alias permissions set up under Accounts tab. See our doc here on how to do that. 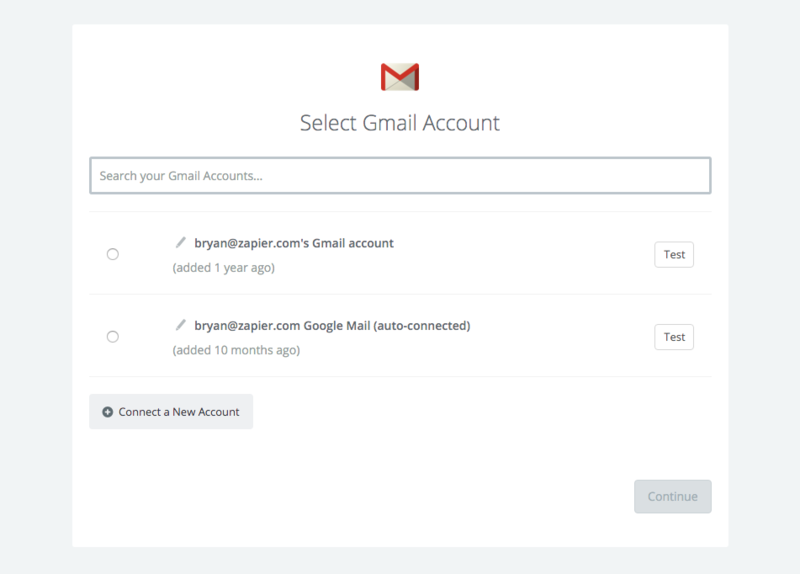 To get started with Gmail, first click to add a Gmail account in your Zap. 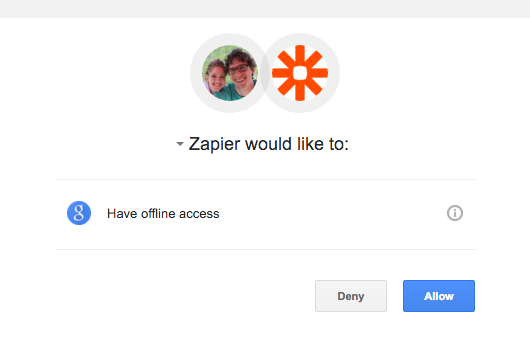 You should then get a pop-up window from Gmail asking you to log-in to authorize the connection between that Gmail account and Zapier. If you are already logged in the pop up will show right away. After logging in, you'll get sent back to your zap where you now have your Gmail account connected! You can click the Test button to make sure it is working correctly! If you're using one of the new email-type Gmail triggers and find that all of the attachments on those e-mails are being zipped use the Gmail "New Attachment" trigger instead. This trigger runs once for every attachment on an email. If you have a fixed file you want to always attach to your email using the send email action, you just need to upload the file somewhere publicly first like Dropbox. One thing to note here is that the file needs to be downloadable. If you click on the above link, notice how the pdf file directly downloads into your computer? This is the type of link that the attachment field needs in order to get those files attached. To get a link like this, I suggest using Dropbox. Below is a tip on how to make a Dropbox file downloadable. When you upload a file to Dropbox, it would give you a shareable link that starts with "https://www.dropbox.com/". What we'll need to do here is to replace "https://www.dropbox.com/" in your link with "http://dl.dropboxusercontent.com" Once you've done that, you can then copy/paste that link to the attachment field of your Action template. Once you get the downloadable link, you can then copy-paste that to your Gmail action step and the file should be attached properly. The "new email" trigger will trigger for each new email regardless of threading. If you only want to trigger once for the entire thread, switch to the "new thread" trigger. The New Labeled Email Trigger will only fetch emails that entered your inbox within the last two days and were then labelled, so if the emails are older than that we will not be able to see them. Additionally, we will only fetch the last 100 labeled emails within that timeframe, so if you have more than 100 labeled emails, some of them won't show up. One option would be to set up an autoforwarding rule in Gmail to send any emails with those specified labels to Email by Zapier and then trigger off "New Inbound Email" instead. Yes! Gmail triggers have a field for HTML message body as well as a field for plain text message body. Yes, be sure to set the "Body Type" field to HTML. However, if you are going to be doing marketing/sales via email, we generally recommend you use a dedicated email service rather than a Gmail Zap. Gmail has a sending limit of 500 emails per day to prevent abuse. 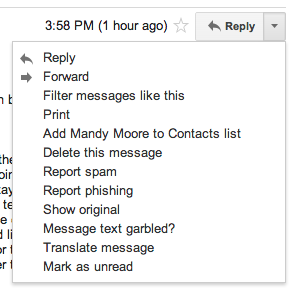 Gmail will also stop allowing you to send email if enough spam complaints are triggered based on the email you send. If you are sending automated, transactional emails of any volume, we highly suggest you switch to a dedicated transactional email provider like Mandrill, Mailgun, or Sendgrid. If you are connected to the wrong account, you can try reconnecting to the right account in a new browser on your Conencted Accounts area here. Gmail currently has a limit of 15 simultaneous connections per account. This effectively means only 15 Gmail trigger Zaps can be used at once assuming no other service is accessing Gmail on your behalf. This is a restriction from Gmail's API documented here. There are no known work arounds except some good old fashioned creativity! If you come up with something awesome, let us know. This happens when you've selected an invalid Mailbox on your Trigger options. You can't use advanced values when selecting a Mailbox. Make sure to choose an existing Mailbox from the dropdown. If you want to create a new Mailbox to use with Zapier, do that inside Gmail and then come back to Zapier to setup your Zap. Switch to using the Inbound Email triggers. 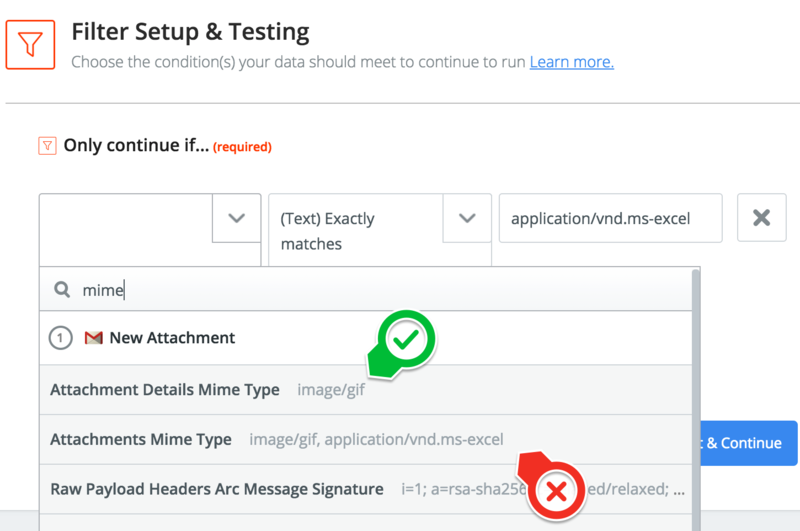 This requires you to setup auto-forwarding for your Gmail account to your Zapier given inbound email address. Switch your Zap to use the IMAP trigger. Find the offending email address. Click the small dropdown in the email and select show original (see below). Copy and paste the entire email into a text file. Send us a support email and include the text file created in step 3. Gmail supports CSS using <style> blocks as well as inline styling. 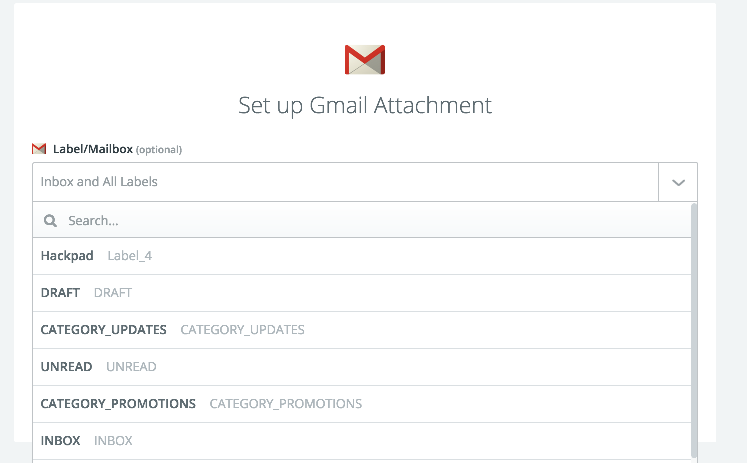 You can see more information on the kinds of styling Gmail supports here.